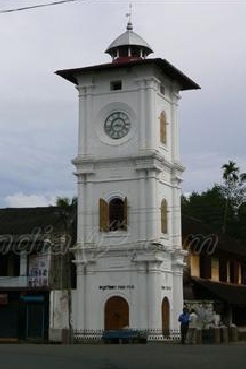 Akka Thangi Betta literally means ‘sister stones’ in the local language. Local folklore has it that centuries ago there were two sisters who came to Hampi were weary from the heat and sat down to rest on the side of the road. On hearing them complain about Hampi, and the city Goddess placed a curse was placed on them and they were converted into rocks/boulders. Infact, in Hampi almost all the rocks and boulders have a story hidden within them. Are they really true? Well, they do make for interesting tales while visiting such a rustic town..
BELLARY: One of the two gigantic boulders, popularly known as Sisters Stone and considered one of the important land marks at the Hampi heritage city, was found broken on Wednesday. The middle portion of the boulder on the right side has fallen down. Official sources told The Hindu that the boulder, which had withstood the ravages of time, split into two because of a natural process and ruled out any human intervention. A crack was noticed in the boulder some time ago. Due to extreme weather conditions, with mercury shooting up during summers and dipping during winter, the vibrations caused by heavy vehicular traffic and the sinking of the soil, the crack might have widened and split into two. Sisters' Stone was among the major tourist attractions here. Tourists used to get themselves photographed near the stone. These stones were also used to organise adventure sports – rock climbing, rappling and the like – during the Hampi Utsav. I was at the Ba'hai temple or the Ba'ahi house of worship in Delhi.. We had come to Delhi as part of a 2week long vacation from college... And this was the last leg of the journey before we boarded the train to head back to Chennai.. The Ba'haí temple is one that welcomes people from all religions, giving them a common space to sit and pray/meditate...The structure is beautiful, in a lotus shape with water bodies surrounding its base. Pristine and white, it has visitors in awe at the sheer size and architecture style... The Ba'hai faith is a world religion whose purpose is to unite all races and peoples in one universal Cause and one common Faith. I noticed a gate to my left and people flocking inside as if it were a museum or a zoo with exhibits that would blow them away.. Caught in the moment of curiosity, i followed suit, no sooner had i taken a step within the enclosure did i notice the clock tower, and the beautiful pale pink structure surrounded by lush green lawns. While i waited the crowds to move on to the next structure, i read a plaque near the pink structure, a mahal of sorts that it was the Lotus Mahal in Hampi. Located within the Zenana enclosure, the Lotus Mahal was meant for the women from the Royal Family and their friends or helps. It is also known as the Kamal Mahal [Kamal meaning Lotus] or the Chitragani Mahal. The arches of the ground floor are recessed and ornate. The architecture style is an interesting mix of Hindu and Islamic styles. 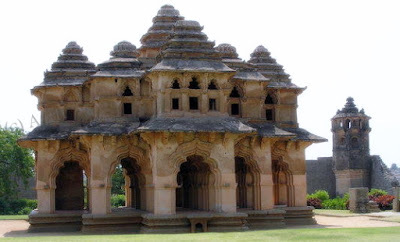 Lotus Mahal’s Islamic style arches and the Hindu style multi player roof and base structure are often quoted for the ingenuity of the Vijayanagara artisans. The Mahal is a two-storeyed building with eight pyramidal roofs created in symmetric form around a higher central roof. The open lower storey has high arched openings, and so do the windows on the upper storey. 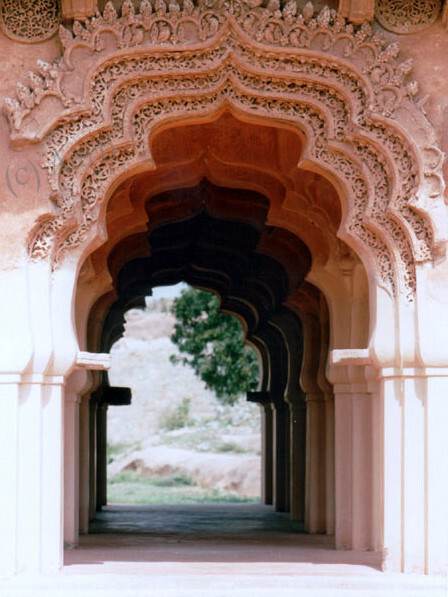 I walked around the structure, captivated by its beauty and the intricate carvings on the arches, whilst a group of tourists with a guide walking nearby. I could hear the guide speak in an animated voice about how the structure earned its name because of the shape it was built in, the archways and the balcony resemble a half opened lotus bud. 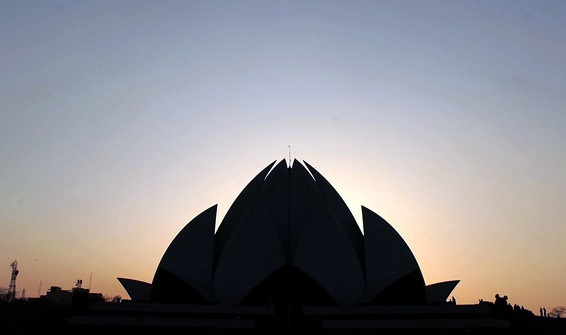 There is also a lotus bud shape that has been carved on to the center dome. I got off the cab, and wandererd around trying to find the source of the sound. All i heard were loud drum kind of beats, that kept floating in the air in a systematic rhythm. Upon following the sound, i discovered a "Chenda" class going on near the Shri Poornathrayeesha Temple in Tripunithura .. 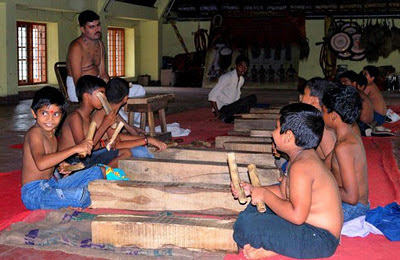 The Chenda is a cylindrical percussion instrument used widely in the state of Kerala. It is also used in some parts of Karnataka where it is called the Chande. A Chenda is made out of a cylindrical wooden drum and has a length of 2 feet and a diameter of 1 foot. Chenda is an essensial accompainment to Kathakali,the classical dance drama of Kerala.This instrument is famous for its loud and rigid sound. Walking up on the wooden stairway, the sound was not far. Spotted a class in progress, with a whole bunch of boys beating a wooden thick stick on a long stone/wooden base. The sound reverberated against the walls and echoed all around. 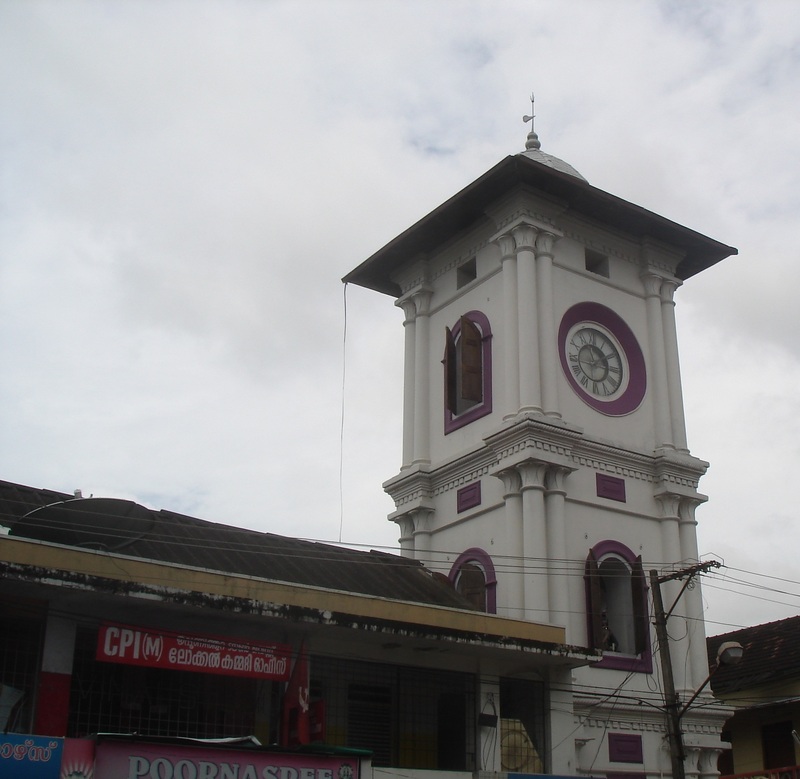 We went outside to wait for the lady[ part of the all women Kathakali troupe who was to show us around] and that is when i spotted the clock tower on the corner of the street. 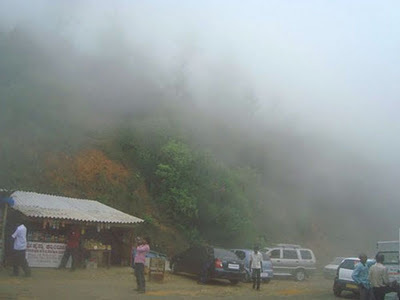 The journey to Coorg was very special, it was happening after years of dreaming and a few cancelled plans as well. We were 3 friends, one from Bangalore and us from Chennai, driving down to Coorg from Mysore. We had booked ourselves for 3 nights at a homestay- CoorgHallimane, in Kushal nagar. As we reached, we discovered the place was quaint, quiet and perfect. They have about 8 rooms in the main building and a few cottages scattered around, and we got to stay in one of those. On opening the window all we saw were mountains on one side and green fields on the other. There was also a swimming pool in the homestay with a small mushroom style fountain in the center. What fun we had playing around in it unwinding after the long drive to Coorg. We dint have any set agenda, but knew there were a few places we would visit for sure. Talacauvery was one of them. It is a good 4500 ft above sea level, and this the where the River Cauvery is born. It is said that the river disappears underground before surfacing again at Naga theertha near Bhagamandala. Infact, Bhagamandala, about 8kms ahead of Talacauvery is where one witnesses the confluence of three rivers, Cauvery, Sujyothi and Kanike. 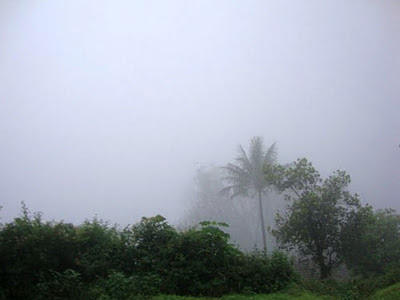 During the drive from Madikeri, cloudy skies and mist was all we saw outside. There was the occasional light drizzle sneaking in through the window. Drizzle turned to rains and it kept up with us through the journey. We had reached Talacauvery as rains lashed away. We braved the rain and walked on, freezing and soaked to the bone, looking for hot tea or any sign of shelter. The only thing we had were the akki rotis and chutney that the staff had insisted we carry along when we left the homestay. What a godsend it was, especially since we had been on the road long and not had a bite since morning. We were so glad to have chosen a Homestay in Coorg instead of a resort, as this experience was so much more homely and comfortable... And like many destinations there are many Coorg Homestays that one is spoilt for choice..!! Rain did subside as we walked towards the shrine and the big tank near the Gundike, where I noticed many visitors taking a quick dip. From there, it was up another set of stairs to visit the temple of Lord Agasthyeshwara [Lord Shiva] and Lord Ganesha. Taking shelter from the rain, we walked along the mandap surrounding the temple, when towards the end I thought I saw a flight of stairs leading to heaven. Well, that’s what I thought till my friend brought me to down to reality. Those steps were to go up Brahmagiri Hill, from where one got a panoramic view of Talacauvery and the city beyond. 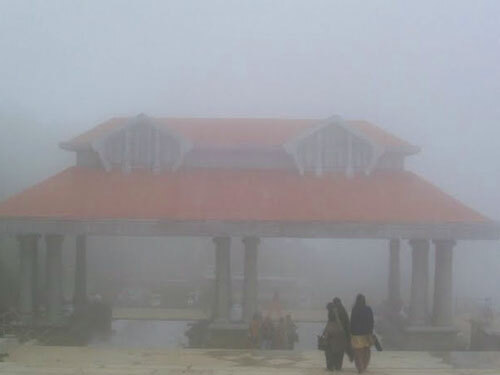 A lady passing by told us the story of how a special yagna was performed by the Saptha Maharishis up in the hills. Had it not been for the rain, we would have made our way up there. What an experience this had been. On the drive back to Kushal nagar to the homestay, there was silence in the car, with all of us still lost in the beauty of Talacauvery. The backwaters interconnected by the Vellar and Coleroon rivers is home to these rich green Mangroves that stretch for miles together. The water canals that run like little roads between the forests offer a hideout for birds and other creatures. 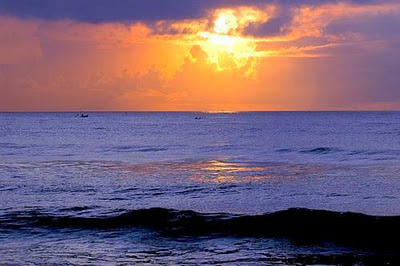 To explore further, one can enjoy a boat ride that is quite popular among the tourists. if you are lucky, you might witness the fish flying out from the water, sometimes into the boat in the process. There is a tower from where one gets a full 270degree view of the Mangrove forests and the ocean beyond as well. Pichavaram has also been featured in quite a few movies, the most recent being the opening scene from Dasavatharam starring Kamal Hassan. The Pichavaram mangroves are considered among the healthiest mangrove occurrence in the world. 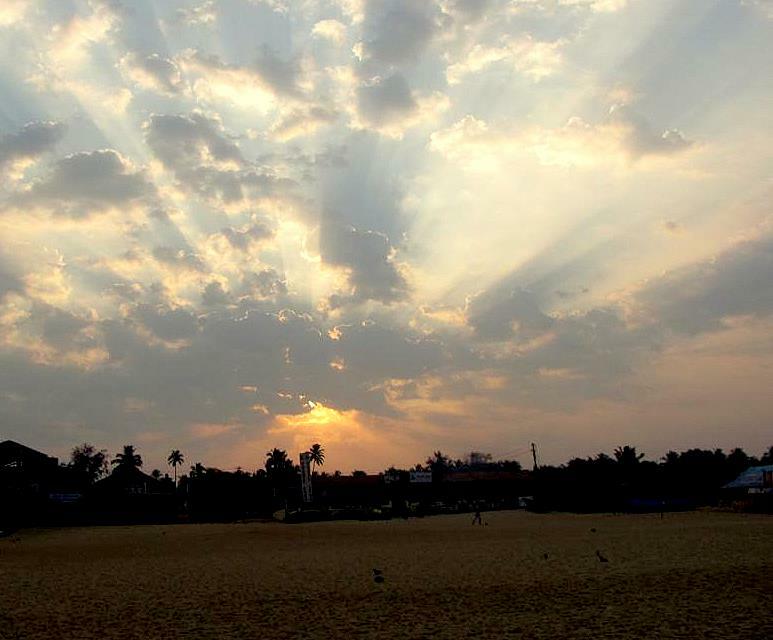 Pichavaram consists of a number of islands interspersing a vast expanse of water covered with green trees. The area is about 2,800 acres (11 km2) and is separated from the sea by a sand bar which is a patch of extraordinary loveliness. The Pichavaram mangrove biotope, consisting of rare species like Avicennia and Rhizophara; presents a special attraction, with its peculiar topography and environmental condition. It supports the existence of many rare varieties of economically important shell and finfishes. The Pichavaram mangroves attract an appreciable bird population of residents, local migrants and true migrants. Amongst others, one can view birds like Watersnips, Cormorants, Egrets, Storks, Herons, Spoonbills and Pelicans. At the mangroves, so far, 177 species of birds belonging to 15 orders and 41 families have been recorded. The season for birds is from September to April every year.